So you've signed your child up to play football or cheer. That's great! But do you actually know the game well enough to understand what's going on out on the field and how to explain the game basics to your child (or for that matter your friends, your co-workers or the person sitting next to you in the bleachers)? There are more than a few parents that love the game, but never had the opportunity to play when they were younger or had the desire to learn the game fundamentals before now. Well, we're here to help you. From right inside the comfort of your favorite chair, we'll give you a simple course in Football 101 so you too can be a knowledgeable arm-chair quarterback. Below is a basic introduction to the game of football at its basic level. The numbers on the field indicate the number of yards to the nearest end zone. The longer boundary lines are sidelines, while the shorter boundary lines are end lines. Near each end of the field is a goal line; they are 100 yards apart. 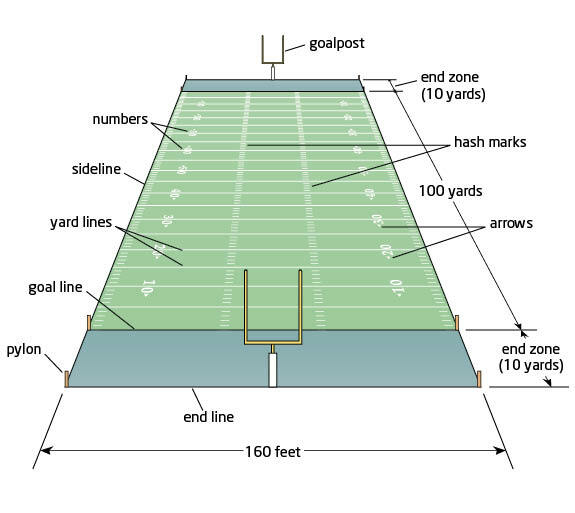 A scoring area called an end zone extends 10 yards beyond each goal line to each end line. While the playing field is effectively flat, it is common for a field to be built with a slight crown—with the middle of the field higher than the sides—to allow water to drain from the field. Yard lines cross the field every 5 yards, and are numbered every 10 yards from each goal line to the 50-yard line. Two rows of short lines, known as inbounds lines or hash marks, run parallel to the sidelines near the middle of the field. All plays start with the ball on or between the hash marks. At the back of each end zone are two goalposts (also called uprights) connected by a crossbar 10 feet from the ground. Each team can only have 11 players on the field at a time. However, teams may substitute for any or all of their players, if time allows, during the break between plays. As a result, players have very specialized roles. Thus, teams are divided into three separate units: the offense, the defense and thespecial teams. 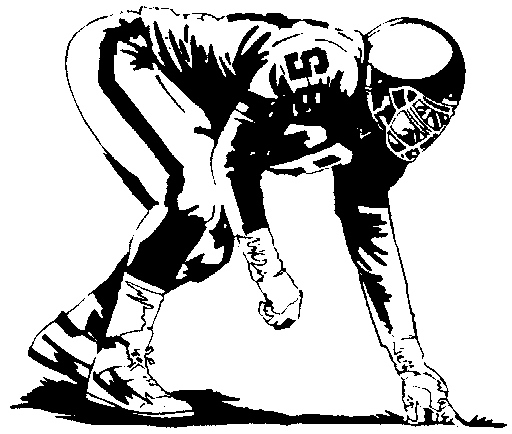 The Offensive Line consists of five players whose job is to protect the passer and clear the way for runners by blocking members of the defense. The lineman in the middle is the Center. Outside the Center are the Guards, and outside them are the Tackles. Except for the center, who snaps the ball to one of the backs, offensive linemen generally do not handle the ball. The Quarterback (QB) receives the snap from the center on most plays. He then hands or tosses it to a Running Back, throws it to a Receiver or runs with it himself. The quarterback is the leader of the offense and calls the plays that are signaled to him from the sidelines. The Running Backs (RB) line up behind or beside the QB and specialize in running with the ball. 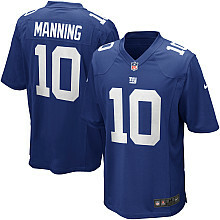 They also block, catch passes and, on rare occasions, pass the ball to others or even receive the snap. If a team has two running backs in the game, usually one will be a Halfback (HB) or Tailback (TB), who is more likely to run with the ball, and the other will usually be aFullback (FB), who is more likely to block. Wide Receivers (WR) line up near the sidelines. They specialize in catching passes, though they also block for running plays or downfield after another receiver makes a catch. Tight Ends (TE) line up outside the offensive line. They can either play like wide receivers (catch passes) or like offensive linemen (protect the QB or create spaces for runners). Sometimes an offensive lineman takes the tight end position and is referred to as a tackle eligible. At least seven players must line up on the line of scrimmage on every offensive play. The other players may line up anywhere behind the line. The exact number of running backs, wide receivers and tight ends may differ on any given play. For example, if the team needs only 1 yard, it may use three tight ends, two running backs and no wide receivers. On the other hand, if it needs 20 yards, it may replace all of its running backs and tight ends with wide receivers. In contrast to members of the offense, the rules of professional football do not specify starting position, movement, or coverage zones for members of the defensive team, except that they must be in the defensive zone at the start of play. 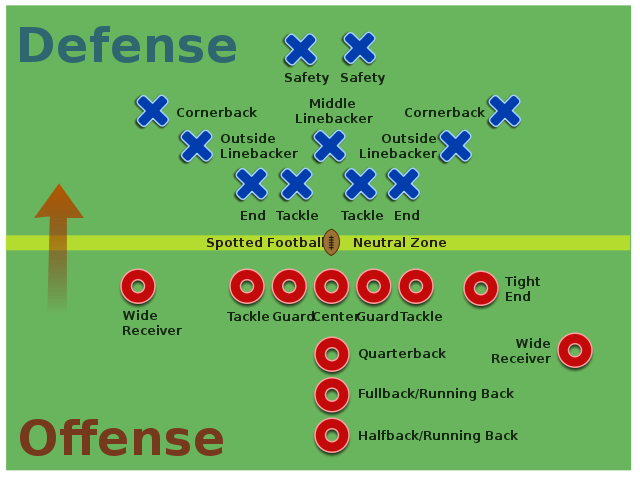 The positions, movements and responsibilities of all defensive players are assigned by the team by selection of certain coverages, or patterns of placement and assignment of responsibilities. The positional roles are customary. The following are customary defensive positions used in many coverages in football. The Defensive Line consists of three to six players who line up immediately across from the offensive line. They try to occupy the offensive linemen in order to free up the linebackers, disrupt the backfield (behind the offensive line) of the offense, and tackle the running back if he has the ball before he can gain yardage or the quarterback before he can throw or pass the ball. They are the first line of defense. Behind the defensive line are the Linebackers. They line up between the defensive line and defensive backs and may either rush the quarterback or cover potential receivers. Their main job is to cover the run up the middle. The last line of defense is known as the Secondary, comprising at least three players who line up as Defensive Backs, which are either Cornerbacks or Safeties. They cover the receivers and try to stop pass completions and occasionally rush the quarterback. However, this leaves the field open for passing. 90–99: Defensive linemen and linebackers. 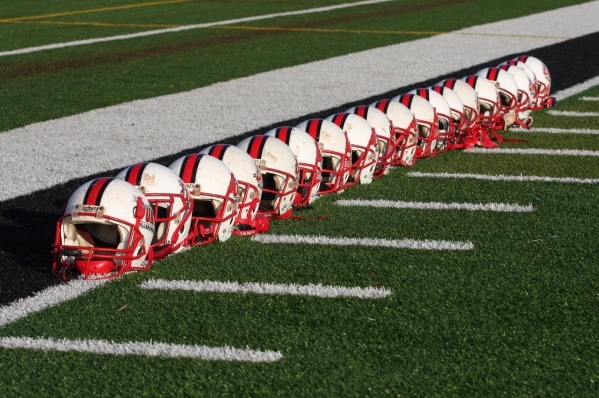 NCAA and high school rules specify only that offensive linemen must have numbers in the 50-79 range, but the NCAA "strongly recommends" that quarterbacks and running backs have numbers below 50 and wide receivers numbers above 79. This helps officials as it means that numbers 50 to 79 are ineligible receivers, or players that may never receive a forward pass. They may choose to either receive the opening kickoff or to kick off. A standard football game consists of four 15-minute quarters (12-minute quarters in high-school football and often shorter at lower levels), with a half-time intermission after the second quarter. If an NFL game is tied after four quarters, the teams play an additional period called overtime lasting up to 15 minutes. 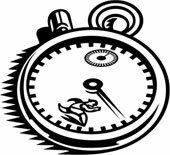 In an NFL overtime game, the first team that scores wins, even if the other team does not get a possession; this is referred to as sudden death. In a regular-season NFL game, if neither team scores in overtime, the game is a tie. In an NFL playoff game, additional overtime periods are played, as needed, to determine a winner. The team that takes possession of the ball (the offense) has four attempts, called downs, to advance the ball 10 yards towards their opponent's (the defense's) end zone. When the offense gains 10 yards, it gets a first down, which means the team has another set of four downs to gain yet another 10 yards or score with. If the offense fails to gain a first down (10 yards) after 4 downs, the other team gets possession of the ball at the spot of the football, beginning with their first down. Except at the beginning of halves and after scores, the ball is always put into play by a snap. Offensive players line up facing defensive players at the line of scrimmage (the position on the field where the play begins). One offensive player, the center, then passes (or "snaps") the ball between his legs to a teammate, usually the quarterback. 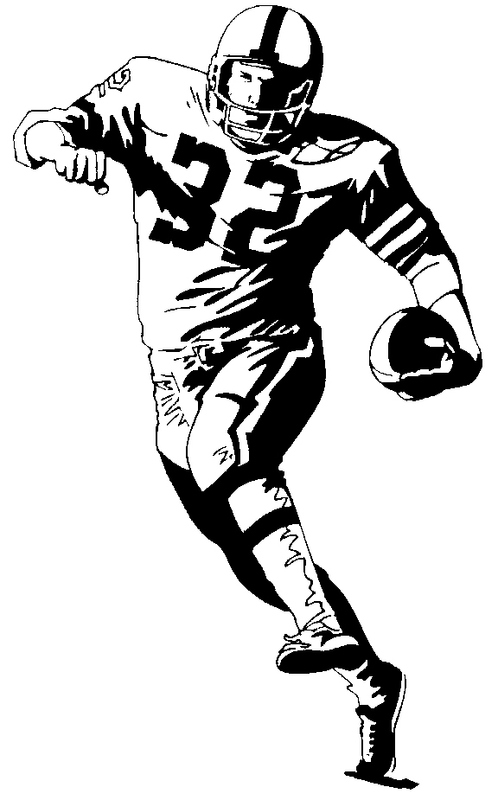 By running with the ball, also known as rushing. One ball-carrier can hand the ball to another player or throw backwards to another player. These are known as a handoff and a backward pass (sometimes referred to as a lateral) respectively. The player with the ball is forced to the ground (tackled) or has his forward progress halted by members of the other team (as determined by an official). An official blow a whistle to notify players that the down is over. Before each down, each team chooses a play, or a coordinated movements and actions, that the players should follow on a down. Sometimes, downs themselves are referred to as "plays." The team fails to get a first down— i.e., in four downs they fail to move the ball past a line 10 yards ahead of where they got their last first down (it is possible to be downed behind the current line of scrimmage, "losing yardage"). The defensive team takes over the ball at the spot where the 4th-down play ends. A change of possession in this manner is commonly called a turnover on downs. The offensive team misses a field goal attempt. The defensive team gets the ball at the spot where the previous play began (or, in the NFL, at the spot of the kick). If the unsuccessful kick was attempted from within 20 yards of the end zone, the other team gets the ball at its own 20 yard line (that is, 20 yards from the end zone). If a field goal is missed or blocked and the ball remains in the field of play, a defensive player may pick up the ball and attempt to advance it. In his own end zone, an offensive ballcarrier is tackled, forced out of bounds or loses the ball out of bounds, or the offense commits certain fouls. This fairly rare occurrence is called a safety. An offensive ballcarrier fumbles the ball forward into the end zone, and then the ball goes out of bounds. This extremely rare occurrence leads to a touchback, with the ball going over to the opposing team at their 20 yard line (Note that touchbacks during non-offensive special teams plays, such as punts and kickoffs, are quite common). A touchdown (TD) is worth 6 points. It is scored when a player runs the ball into or catches a pass in his opponent's end zone. A touchdown is scored any time a player has possession of the ball while the ball is on or beyond the opponents' goal line (or the plane above it). After a touchdown, the scoring team attempts extra points. The ball is placed at the other team's 3-yard line. The team can attempt to kick it over the crossbar and through the goal posts in the manner of a field goal for 1 point (an extra point or point-after touchdown, or run or pass it into the end zone in the manner of a touchdown for 2 points (a two-point conversion). A safety, worth 2 points, is scored by the opposing team when the team in possession at the end of a down is responsible for the ball becoming dead behind its own goal line. For instance, a safety is scored by the "defense" if an offensive player is tackled, goes out of bounds, or fumbles the ball out of bounds in his own end zone. Each half begins with a kickoff. Teams also kick off after scoring touchdowns and field goals. 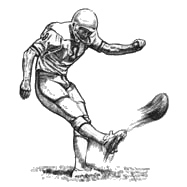 The ball is kicked using a kicking tee from the team's own 30-yard line in the NFL. The other team's kick returner tries to catch the ball and advance it as far as possible. Where he is stopped is the point where the offense will begin its drive, or series of offensive plays. If the kick returner catches the ball in his own end zone, he can either run with the ball, or elect for a touchback by kneeling in the end zone, in which case the receiving team then starts its offensive drive from its own 20 yard line. A touchback also occurs when the kick goes out-of-bounds in the end zone. 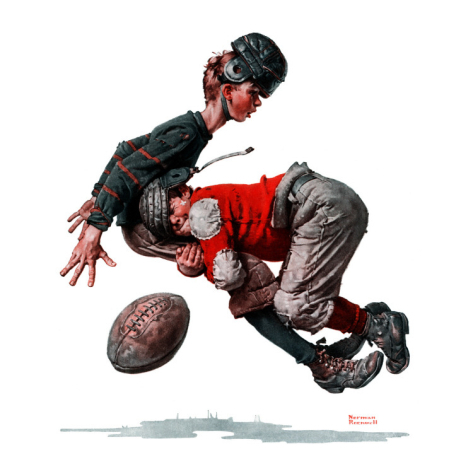 A kickoff that goes out-of-bounds anywhere other than the end zone before being touched by the receiving team is a foul, and the ball will be placed where it went out of bounds or 30 yards from the kickoff spot, depending on which is more advantageous to the opposite team. Unlike with punts, once a kickoff goes 10 yards and the ball has hit the ground, it can be recovered by the kicking team. A team, especially one who is losing, can try to take advantage of this by attempting an onside kick. Punts and turnovers in the end zone can also end in a touchback.